Published in 2005, this is exhaustively researched, beautifully illustrated, and definitely covers all the bases when it comes to information on the Noah's ark site. A wonderful way to interest visitors to your home or office to the subject, too. Once they pick it up, it will be hard to put down! Why do we find mention of the flood in most of the worldÂ¹s oldest civilizations? Is the story of Noah's Ark indeed not only a myth, but an actual event that occured 5,500 years ago? These are some of the mysteries that journalist and author Henri Nissen seeks to unravel in this interesting and provoking book. In the face of today's established theories, he daringly questions the evolution of the earth and shows that things may not be as we have so long accepted. Nissen has traveled extensively in the mountains of Ararat on the borders of Turkey and Iran. Now you can travel back through these journeys with him, as he takes a sharp look at "eyewitness" accounts. Nissen will also offer his own fascinating insight on where the ship of Noah may have landed and it is not the location of popular consensus. Could generations of ark-hunters have been searching the wrong mountain? This book rejects the idea that our forefathers were club-swinging primitives; man might even have had a higher intelligence before the devastating flood, thanks to climate. As one theory states, a vapor canopy was once surrounding earth, thereby giving protection against the cosmic irradiation that causes aging. Could this reveal how the rainbow was first seen after the Flood? Perhaps it's also the explanation for the giants who lived before it, as according to not only the Bible but also Sumerian lists of kings as well as myths from other ancient civilizations. This book contains a wealth of details to challenge the most articulating mind. It contains an interview with geophysicist Dr. John Baumgardner, as well as scientific materials presented by Baumgardner and his Turkish counterpart, Dr. Salih Bayraktutan. Historic photos and paintings have been provided by Elfred Lee, the single living person with the greatest experience in searching for the Ark on Mt. Ararat. And as you'll learn, Lee has some shocking revelations of his own. 320 pages, hard cover, color, illustrated. About Henri Nissen: Henri Nissen was trained at the Danish School of Journalism in Aarhus, Denmark, and has written thousands of articles, produced radio and television, and has written seven books, of which multiple have been translated to other languages. He has traveled extensively in Asia and Africa and worked in Cameroon for three years. At present he is the editor-in- chief for a newspaper and is a communication consultant for The Lutheran World Federation in French-speaking Africa. Noah's Ark is his personal hobby, and he has visited the area around Mt. 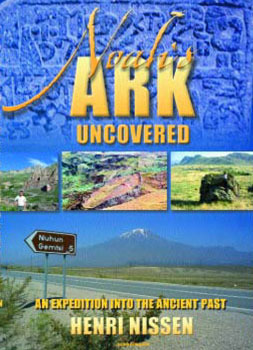 Ararat and the boat-shaped object several times. He is married to Birthe and has three lovely children.